So you’re on your way to the shore with a couple of your closest friends and while you’re trying to shove your orange and yellow beach chair into a truck that was about to burst three beach bags ago, you remember that you have forgotten to buy sun block. So, what do you do? Well, you get into the car and rush over to the nearest Rite Aid and head down the summer aisle to find yourself overwhelmed by more than thirty different brands of sunblock. With so many options you reach for the closest one, hoping you made the right choice. But at the end of the day, you and your friends come back home with a not so hot burn. This could have all been avoided if you did your homework, but who has time for homework? Oh, that’s where I come in, I’ve already done the research for you and I have came up with a list of seven super saving sunblocks. Aveeno® Protect + Hydrate®: This is great, especially if you have already had sunburn. Sunburns can do a lot of damage to your skin and it can leave your skin feeling dehydrated and leathery, but Aveeno® Protect+Hydrate® contains oatmeal, which is a natural soothing moisturizer. So not only does this sunscreen protect you against UVAs and UVBs but it also soothes and moisturizes your skin in the process. Coppertone® Clearly Sheer™: I know what you’re thinking, my great grandmother used Coppertone® when she was a kid, this can’t be any good for me now. Well, Coppertone® has come out with a new look and formula. Coppertone® Clearly Sheer™ is guaranteed to leave skin feeling softer, won’t cause breakouts, it’s fast absorbing and to top it all off it is water resistant. Advance Suncare Quick Dry® is non-greasy, non-sticky, oil-free and alcohol-free; sounds like the best stuff out there. All you have to do is spray it on and it is instantly absorbed. Love it. Banana Boat® Sport CoolZone™: Instantly cools skin during application, Thank god for menthol! If your skin is already feeling the heat just spray Banana Boat® Sport CoolZone™ on for an instant relief. This sunblock can be found both in a lotion and sheer spray plus it is water resistant, just make sure to apply every 80 minutes. 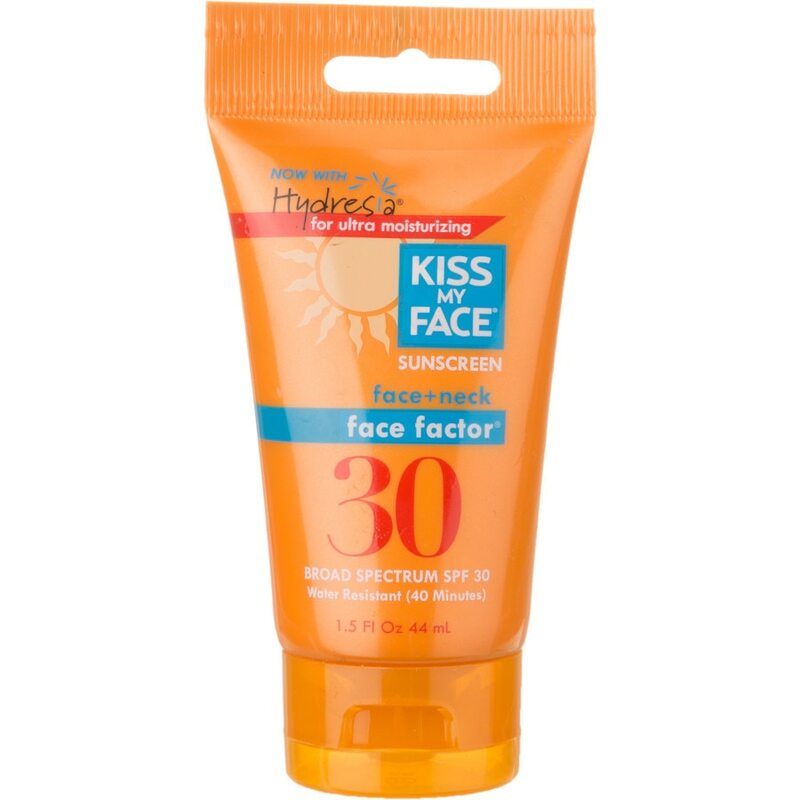 Kiss My Face® Face Factor®: Wow! Kiss My Face® Face Factor® for face and neck is formulated with green tea, licorice and cucumber extracts. It also contains a lot of good other stuff to help fight against the appearance of wrinkles, to hydrate and soothe and lastly to decrease skin’s sensitivity to the sun. That’s not a big deal, wait until you hear that this lotion contains little tiny capsules of oil that release over time to provide the ultimate hydration. Neutrogena® Clear Face Liquid Lotion: If your face is very sensitive and susceptible to breakouts then Neutrogena® Clear Face Liquid Lotion is what you would want to be picking up at your local drugstore. This lotion is weightless, leaving skin with ample room to breath and it won’t leave your skin feeling oily because it has a water-light texture. Neutrogena® Pure & Free™: This is for all the makeup lovers out there. Neutrogena® Pure & Free™ is a fragrance-free lightweight formula. It is great for applying everyday under makeup and it will not leave your face feeling or looking cakey while it protects you against those harsh sun rays. Summer Skin Care featured photo courtesy of Joe Shlabotnik on Flickr. Photos courtesy of iherb.com, Backcountry.com, and Amazon.com.